According to the U.S. Census, about 33 million Americans claim Irish ancestry – that's about five times the population of the entire Emerald Isle. March is Irish-American Heritage Month and the President issues a proclamation commemorating the occasion each year. For Americans of Irish heritage, there is much to celebrate. Beginning with our Nation's founding, Irishmen risked their lives to establish what would become the United States of America. At least nine men with Irish heritage signed the Declaration of Independence – considered a death warrant for signatories at the time – including three who were born in Ireland. Thomas McKean emigrated to the colonies as a child from Derry and later served as President of Delaware. Charles Carroll was born in Maryland and traced his ancestry to Tipperary. James Smith emigrated to the American colonies as a boy. George Taylor was born in Antrim and emigrated to America in his early twenties. Matthew Thornton emigrated from Limerick and served in the New Hampshire Militia. Edward Rutledge was the youngest signer of the Declaration and the son of Dr. John Rutledge with familial ties to Tyrone. Thomas Lynch Jr. was the grandson of Jonas Lynch of Galway. George Read was the son of John Read, who emigrated from Dublin. John Dunlap was born in Tyrone and emigrated to Philadelphia at age 10. 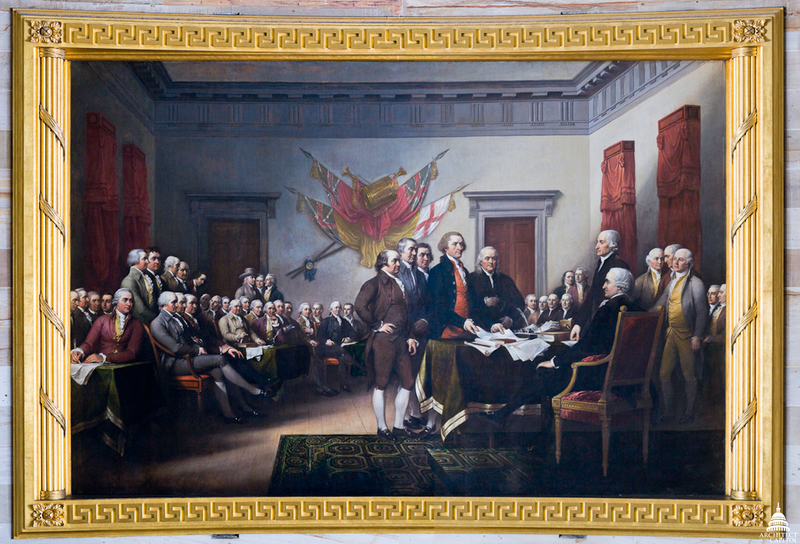 In the Capitol Rotunda, Declaration of Independence by artist John Trumbull depicts the moment that the document was presented to the Second Continental Congress. Several, but not all, of the signers are represented in the painting. Throughout American history, you can find members of Congress, Presidents and Vice Presidents with familial ties to Ireland: O'Neill, Ryan, Mulvaney, Brady, Kennedy, Reagan, Biden and many others who have served our nation. Even President Obama has traced his ancestry back to a small village in the midlands of Ireland. In the Hall of Columns, a statue of James Shields greets visitors, members and staff entering the U.S. Capitol from the Independence Avenue entrance. Shields emigrated from Tyrone, Ireland in the early 1800s and is the only senator to represent three states (Illinois, Minnesota and Missouri). His uncle, also named James Shields, served as a representative from Ohio. 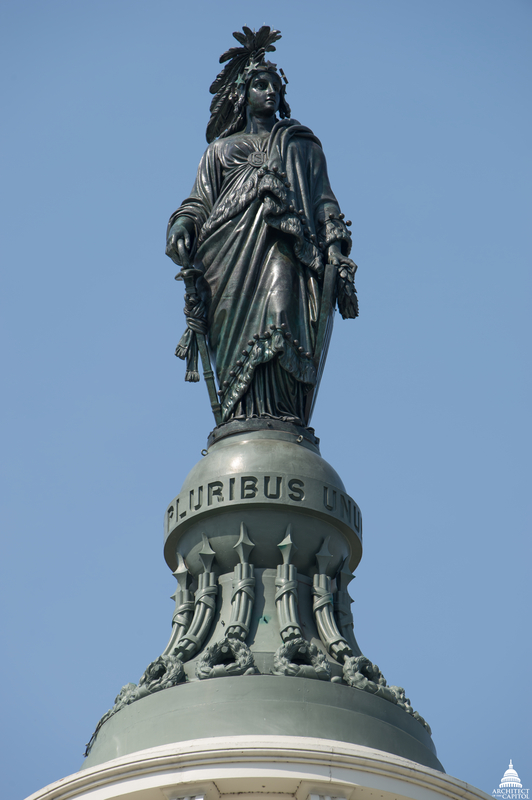 The Statue of Freedom, the crowning feature of the Dome, also has Irish connections. Moulders John Carr and Michael Shedy, who were born in Ireland, helped cast the statue at a foundry located off Bladensburg Road, S.E. While Irish-American Heritage Month celebrates all that the Irish have done in support of America, it is worth noting that 2016 is a special anniversary in the quest for independence for Ireland. A century ago, between April 24 and April 29, 1916, the Easter Uprising against British rule in Ireland took place in Dublin. Although the rebellion was swiftly defeated by British forces, it led many in Ireland to seriously consider the possibility of an independent Irish Republic. The Easter 1916 Proclamation of the Irish Republic specifically acknowledges the uprising as "supported by her exiled children in America." To honor and celebrate our shared history, events on the Capitol campus this spring will mark this special occasion and commemorate the strong relationship between the United States and Ireland.